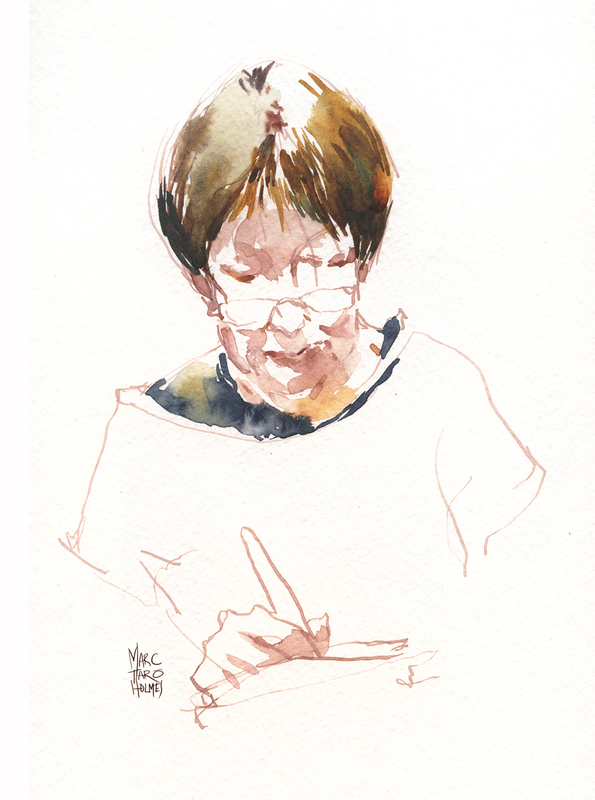 Here’s some little portrait sketches from our last USK:MTL dim sum lunch. 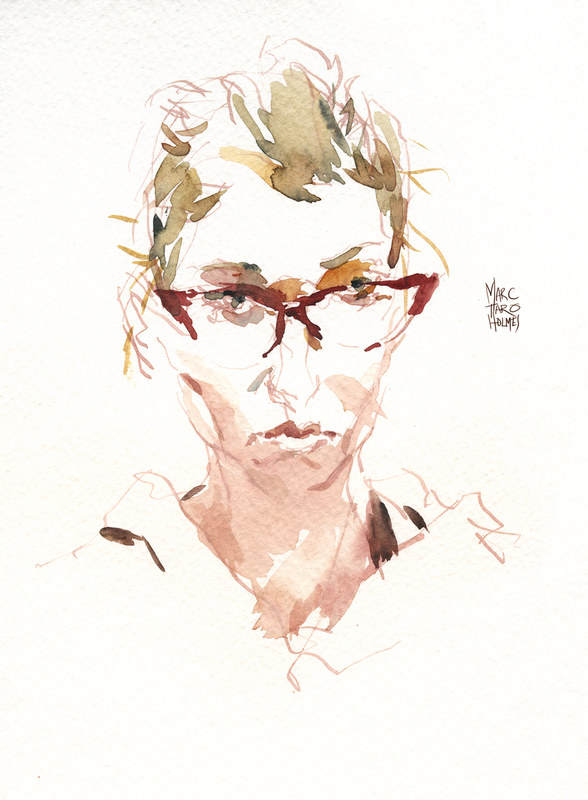 There’s a style right now for brightly colored eyeglass frames that makes for fun drawings. My feeling on drawing eyeglasses is – don’t draw the entire frame. Leave some of it to the imagination to avoid overpowering the face. I suppose that is weird advice – because I can say that about absolutely anything. Don’t draw everything you see :) Less is more. Make the viewer interact with the sketch. Make the brain interpret the lines. It’s more fun for everyone. I still had my small vial of diluted ink to draw with. I think it really works for these little portraits. They’re in a 6×9″ pad of Strathmore 400 watercolor paper. I had thought these were cheap little pads (I bought them in a Michaels in some small town, as emergency back up on a trip). But it’s actually very nice paper. I finally realized, when it comes to Strathmore paper, the higher the number the better (300,400,500). There’s a lot of realism and light in these portraits … excellent how you also leave something to the imagination. Great technique! Love the light in these portraits. It’s such a balancing act between the lights and little hits of dark that give these faces (and anything else we draw) depth and realism. I really enjoy seeing your work. 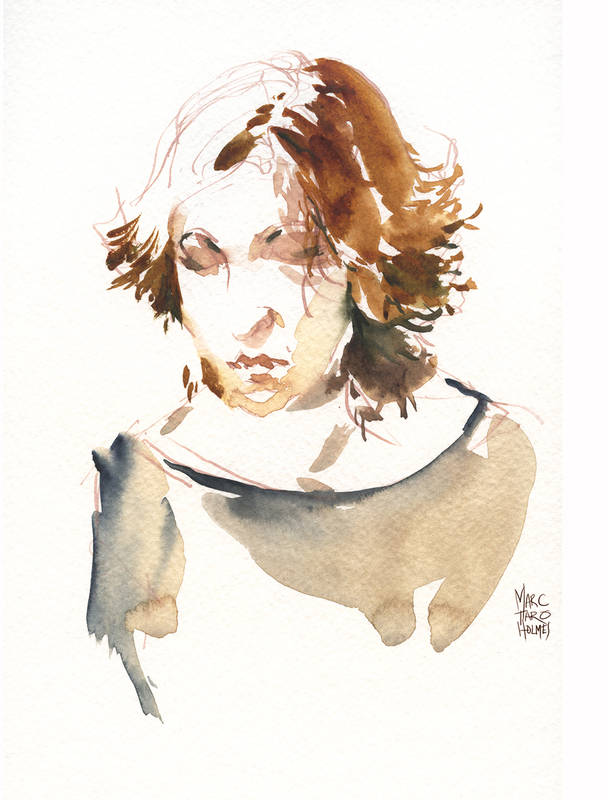 These portraits have life! . There is more energy or movement in a sketch when lines are missing or open. I have a question on the diluted ink…are you using it with a dip pen or fountain pen? Thank you. I will have to try it! Really nice loose work – well done! Nice work, Marc. Looking at your line width variation– if I may ask, what kind of nib are you using? I can’t get that kind of line variety with my typical dip pen nibs. I have a kind of grab bag of hand-me-down nibs. I’m not even sure what they all are. The two I like, that are most commonly in shops around here: a Japanese crowquill called a Zebra “G” nib (used for fine lines), and a bigger, more flexible Brause 361 Steno also known as The Blue Pumpkin for its round ink reservoir and gunmetal blue finish. I also use Brause 0.75 and 2.5mm Chisel Tips for bolder accents. (These are the kind with the the little reservoir clipped on top). Nice sketches and I appreciate your explanations as well. 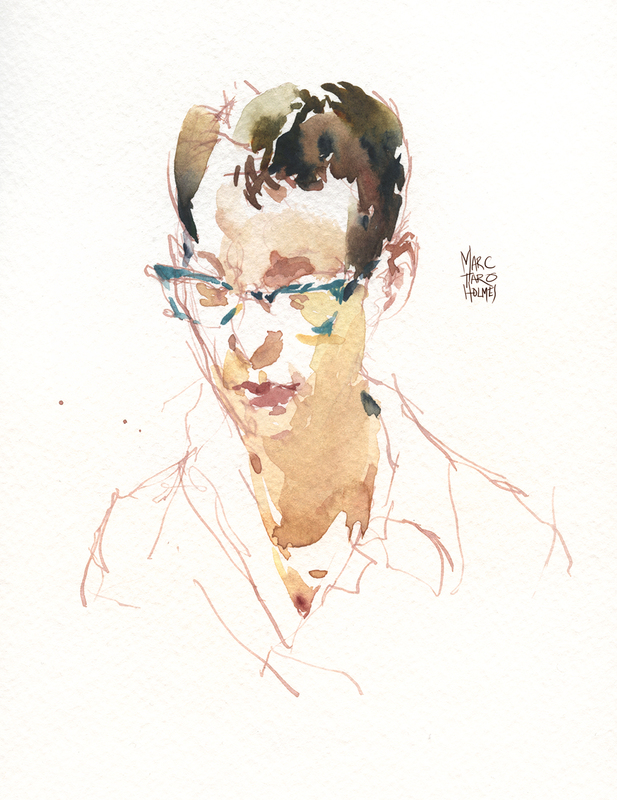 I’ve been using the Strathmore 500 paper in a sketchbook and am very happy with its quality and durability- it can take a lot of heavy washes without any damage. I also like to see you working almost in monochrome with spectacular results.